I have a friend and co-worker who is a HUGE Jane Austen fan. I mean, she wears a t-shirt to work occasionally that says "Straight Outta Pemberley"...which is the sort-of thing you can get away with wearing when you work in a Library. Her birthday is coming up later this month, so I thought I'd make a Bookish Goodies guide full of cool Jane Austen items in her honor. I'm an Austen fan, but not nearly as big of one as she is. So without further ado...here are my favorite Austen items from the glorious institution that is Etsy. I am completely enamored with the Etsy shop SweetSequels and their cloth baby books! I will probably do a short post just filled with their beautiful items because I can't get over how gorgeous they are. The pic I chose doesn't necessarily do them justice, so please follow the link if you know anyone having a baby soon. 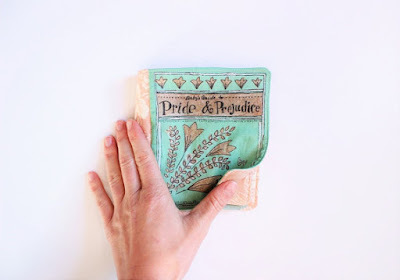 This cloth Baby's Guide to Pride and Prejudice for $35 is made to order with gorgeous hand painted illustrations, and would make an incredible keepsake. 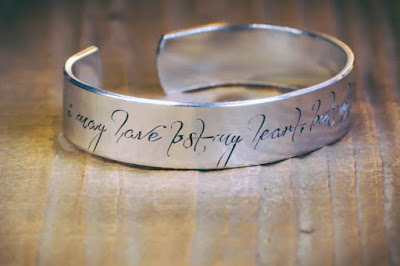 This aluminum bracelet has a quote from the book Emma engraved on it..."I may have lost my heart but not my self-control". I think it's a beautiful statement piece for $15 from thewinsomewordsmith. I have a beautiful Jane Eyre book purse that a friend bought for me from NovelCreations on Etsy so I can personally testify to the quality of their work. They are definitely worth the money, and far prettier in person than any photo could do them justice. 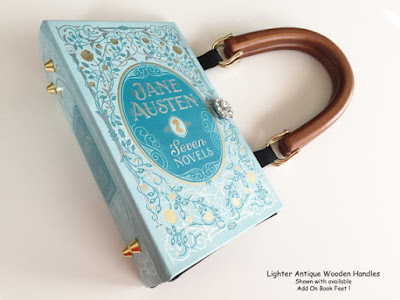 This Jane Austen book purse from NovelCreations costs $60 complete with choices in styles of handles and buttons. These are must-see statement bags...I can't say enough about them really. You can never have enough Tote bags really, and this incredibly girly pink and purple tote complete with Emma quote is the perfect bag to use for your library books...or to take shopping with you. Why not let the world know you're a fan of Romance?? 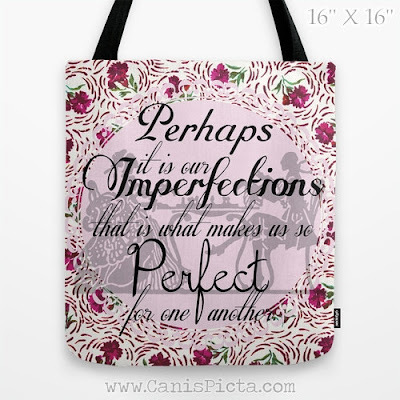 You can find this tote on CanisPicta for $35+. 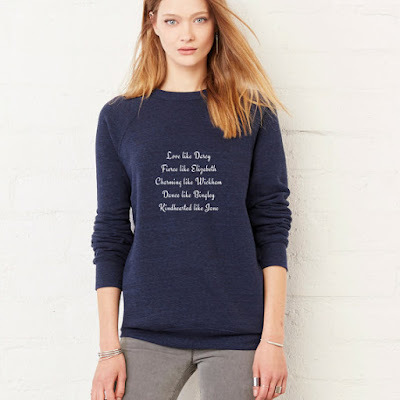 I love this Pride and Prejudice sweatshirt. It says "Love like Darcy. Fierce like Elizabeth. Charming like Wickham. Dance like Bingley. Kindhearted like Jane". This really sums up that book I'd say. Mind you, I read Pride and Prejudice and Zombies last, so I might be mixing things up in my head a tad. You can find this on theavantmarket for $39+. I think cool phone cases are a great way of showing your personality. I have a beautiful watercolor bird case on my phone at the moment. 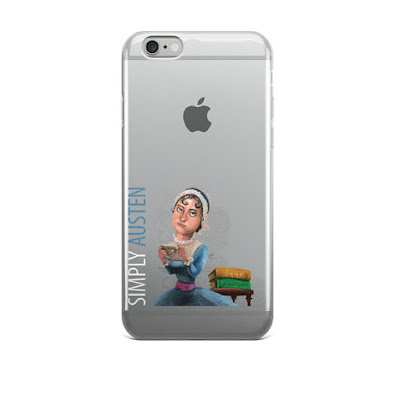 If you're an Austen fan, why not show it off with this sassy Simply Austen iPhone case from SimplyCharly for $25? The shop also has Darwin, Shakespeare, Twain, Sartre and more...in case Austen isn't your thing (how dare you!). 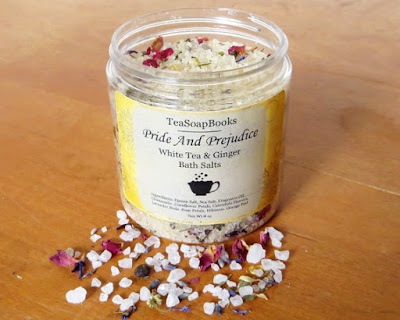 These Pride and Prejudice White Tea and Ginger Bath Salts look beautiful, and I'm sure they smell gorgeous also. They come packaged in a muslin bag labeled "Library Bag Bath Salts" which sounds like perfection to me. You can find them on TeaSoapBooks for $10. 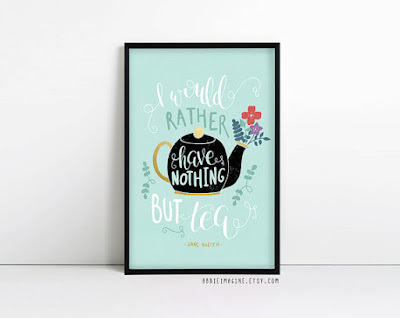 I LOVE this "I would rather have nothing but tea" Jane Austen quote..and I think this print would look beautiful framed on your buffet next to your mugs and Keurig. It's perfect for the tea drinkers I know, who are sick of seeing beautiful coffee signs everywhere and no love for tea. It can be found, along with plenty of other beautiful prints, on the AbbieImagine shop for $8.37+. It wouldn't be a Bookish Goodies guide without a cute coffee mug. 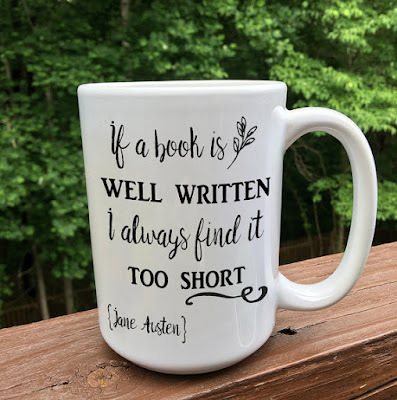 So here's the perfect Bookish Jane Austen quote...one that would look terrific filled with a steaming hot beverage next to a glorious book. (If you buy it, take a picture for Instagram and tag me in it PLEASE!!) This mug was made for the bibliophile in your life...Austen fanatic or not. You can find it on IvoryPaige for $16. Last but not least I have a new T-shirt to eclipse the "Straight Outta Pemberley" one my friend is so fond of. 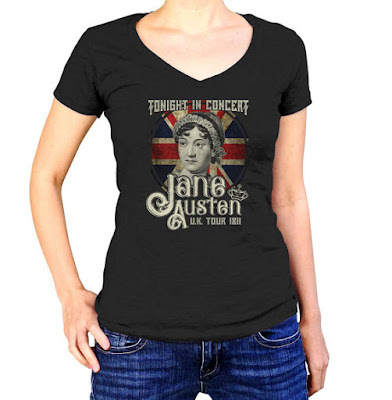 This Rock and Roll Jane Austen shirt is AMAZING!! I can't even complain about it being in Juniors tiny sizes because it even comes in MENS sizes up to 3XL! LOL So there is literally nothing I can say wrong about this...it is perfection. Thanks to boredwalk where it starts at $25. 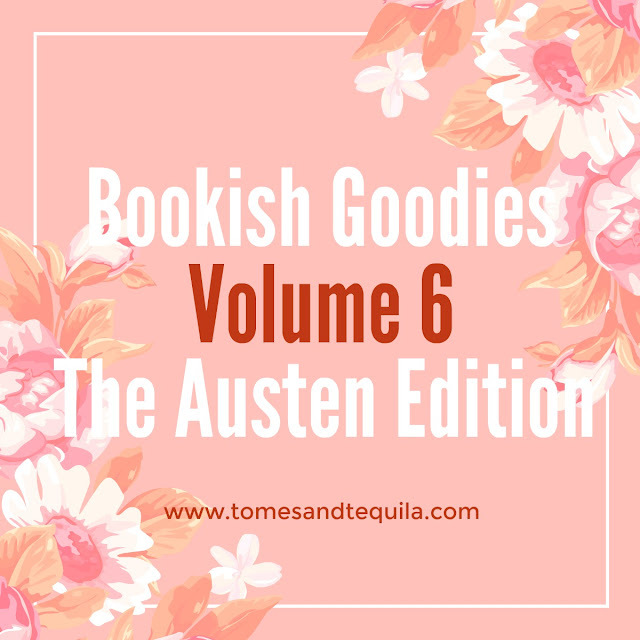 So there ya go...a Bookish Goodies for the Jane Austen fanatics in my life. I hope you like it. Let me know if you have a fandom you'd like me to do a guide for. I have way too much fun perusing Etsy for these. Plus it helps to keep my shopping compulsion in check. 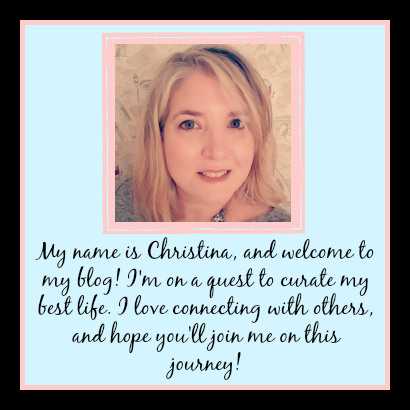 Leave me a comment either here or over on my Facebook page!